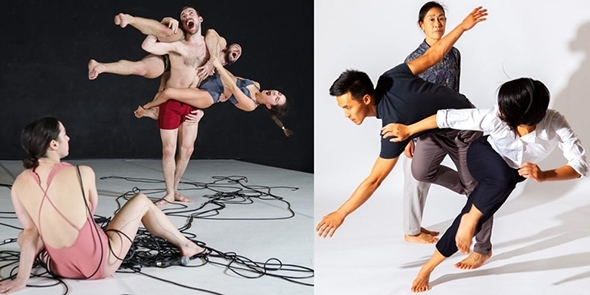 In a well-curated double bill of works by two choreographers each creates a context for the other. On the surface and in their treatment of their respective subjects Yukiko Masui’s Falling Family and Léa Tirabasso’s The Ephemeral Life of an Octopus are quite different, but each is based on a personal experience about the nature of life and death. The subsequent self-questioning creates a bridge between the works that allows us to confront mortality in ways that, as Masui writes, are ‘simply not expressible in speech.’ While Masui takes us into her Falling Family with a heightened sensibility that creates feelings of empathy, Tirabasso’s The Ephemeral Life Of An Octopus leads us through the confusion and corrosion of life’s breakdown with a confrontational performance that ends up counter-intuitively expressing an exhilarating sense of joy. The subtlety of Masui’s conception reflects the passage of time in meticulously constructed moments that suggest rather than define until metaphor and narrative become so intimately entwined that they coalesce. She introduces us to the members of the family one by one in separate sections delineated by Ben Moon’s lighting and Ezra Axelrod’s spliced snippets of Japanese conversation. As the work unfolds, relationships begin to overlap and then build up in a choreographic layering in which the characters move with a resigned sense of self-control that their use of articulate gesture further refines; Mohri’s opening hand gestures of everyday life in Moon’s precise downlight sets the tone for the entire work. Seki’s quiet presence is the one that starts to retreat into itself; Axelrod’s score becomes plangent in its final evocation of drama, leaving Mohri — reflecting perhaps Masui’s own response — challenging fate in a final, uplifting solo of rage against the dying of the light. The visual contrast between Fallen Families and Tirabasso’s The Ephemeral Life Of An Octopus is marked. Nicolas Tremblay’s high-voltage lighting keeps the levels high on a white stage littered with black microphone cables while the subtle hues of Giulia Scrimieri’s costumes are replaced by bright splashes of coloured swimwear for the four extrovert performers: Caterina Barbosa in Prussian blue, Alistair Goldsmith in pink, Joachim Maudet in green and Rosie Terry Toogood in bright orange. Stark juxtapositions abound, perhaps none more so than that of the romantic third movement of Brahms’ second piano concerto with the flagrantly staccato, animalistic contortions of the performers (Gabrielle Moleta is listed as Animal Transformation Coach). But given the work is informed by Tirabasso’s own experience with ovarian cancer, such contrasts are not as virulent as might appear; the romantic notion of life that Brahms lays before us has no place in it for the contemplation of disease. Tirabasso’s metaphors derive from philosopher Thomas Stern’s essay, The Human and the Octopus, in which he takes his own illness as a starting point for discussing the relationship of mind and body, quoting on the one hand from Proust who sees the mind with which we identify as trapped inside the body of an alien — an octopus — and on the other from JM Coetze for whom the flesh of the body and its susceptibility to pain is an incontrovertible reminder of our humanity. In The Ephemeral Life of an Octopus, Tirabasso uses the dance body as a thick brush with which to paint these conflicting notions. Corrosive metaphors of physical breakdown are not unfamiliar in art but there is an undercurrent of wit in Tirabasso’s choreography, in her choice of music (including an original composition by Martin Durov), in the colour and light of the production and in the relentless play of healthy bodies in a compulsive setting of dis-ease that negotiates a path between spirit and flesh, between intellect and play that taken as a whole borders on an unequivocal celebration of life.